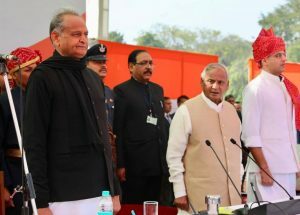 Senior Congress leader Ashok Gehlot took oath as Rajasthan Chief Minister and Rajasthan state Congress president Sachin Pilot was sworn in as deputy chief minister on Monday at the Albert Hall in Jaipur in a ceremony marked by the presence of senior Congress leaders and opposition figures. 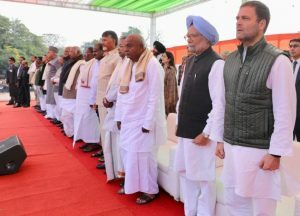 Congress president Rahul Gandhi, former Prime Minister Manmohan Singh attended the event along with JD(S)’s HD Deve Gowda, Andhra Pradesh Chief Minister N Chandrababu Naidu, Karnataka Chief Minister HD Kumaraswamy, former Chief Minister Vasundhara Raje, NCP’s Sharad Pawar, Senior Congress leader Navjot Singh Sidhu, RJD leader Tejashwi Yadav and Aam Aadmi Party leader Sanjay Singh. 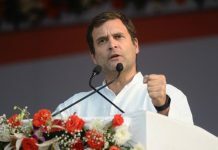 Gehlot was first-elected to Parliament in 1980, and went on to win Lok Sabha elections four more times from Jodhpur’s Sardarpura assembly constituency. 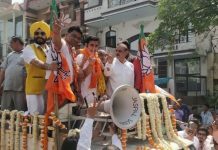 Pilot represented Dausa and Ajmer in the Lok Sabha in 2004 and 2009 and fought recently concluded assembly election for the first time. BSP supremo Mayawati and SP’s Akhilesh Yadav and West Bengal Chief Minister and Trinamool Congress chief Mamata Banerjee did not attend the swearing-in ceremony.